A view from the forest to the Mendonca Cabin. 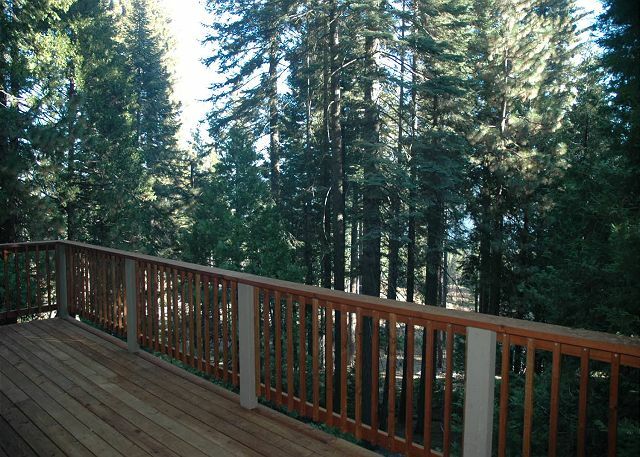 This home backs up to Big Trees State Park - you can walk right out into the woods or enjoy them from the deck. 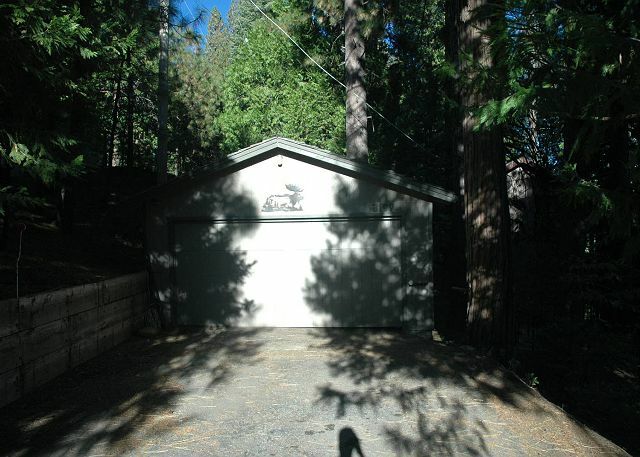 There is a level parking area in front of garage for guest use. The walkway to the home is on a downslope. Deck with two umbrella covered tables and chairs. And what a beautiful view. There is also a propane BBQ for summer use. The large windows and glass doors in the living room offer lots of natural light. 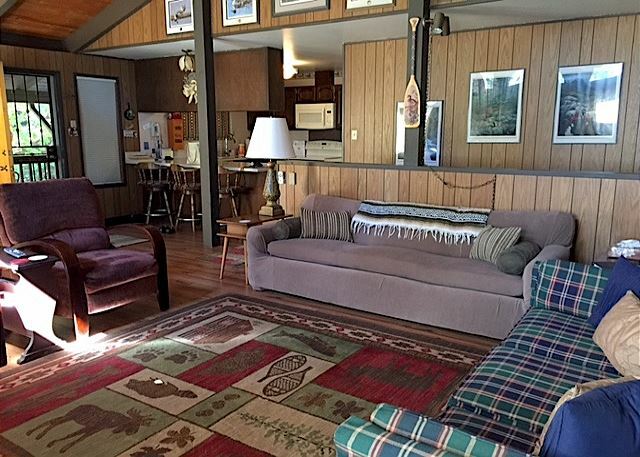 Plenty of comfortable seating - all facing the fireplace and flatscreen TV (not shown.) The front entrance door, kitchen and breakfast bar can be seen in the center of the photo. Open ceiling with wooden beams gives that "mountain" feeling to this home. The enclosed fireplace in the living room provides a wonderful heating source for the house. The furniture situated around it affords a comfortable environment while watching tv, enjoying a cup of coffee and a book, or just hanging out with loved ones. The dining room table is located next to the deck door and a side window, letting in lots of light and providing beautiful views of the surrounding forest.Seats 6 easily. Adjacent breakfast bar seats 3 more. Additional seating for 3 is available at the breakfast bar. The fully equipped kitchen with plenty of counter space is conveniently located also. 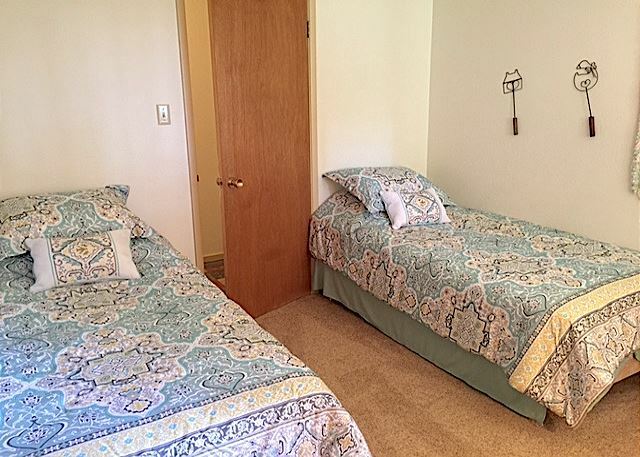 The first bedroom is located on the main level of the home and is a spacious bedroom with two queen beds. Main floor bathroom has a combo tub/shower. The second bedroom is located downstairs on the ground level and has a king size bed The third bedroom is also located on the ground level and has two twins. Downstairs bathroom has a walk in shower. The pellet stove in the downstairs game room will warm the entire level. The game room is located on the bottom/ground level of the home. There are lots of cute 50's decorations down here, including Betty Boop, Elvis and Walt Disney memorabilia. The pellet stove is in the corner behind the sofa. The game room has a TV with DVD player, table for cards, board games or puzzles and a pull out sleeper sofa. The washer & Dryer are also located on this level. This room has all new flooring in 2017 ( Photo coming soon ! ) Just a short drive to Alpine Lake and many more small lakes. Great for kayaking, canoeing, fishing, hiking, swimming or just a picnic ! ALL CABINS HAVE A HOUSEKEEPING CHARGE AND COUNTY TAX IN ADDITION TO THE RENTAL CHARGES. 3 Night Minimum During Holiday Periods. Walk or ski in to open forest from the back of this home. What a View! 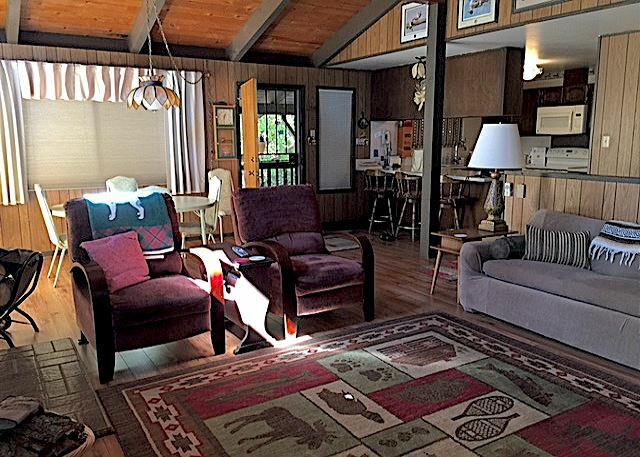 This home is well maintained and exudes warmth and comfort. 2 story, great sunny deck. Access is downslope. Family room has fireplace w/wood burning insert. Game room downstairs has a pellet stove. Lovely yard in spring/summer. Flat screen tv in living room. 2 TVs, VCR, cable, Internet available. One bedroom and bath on main floor. 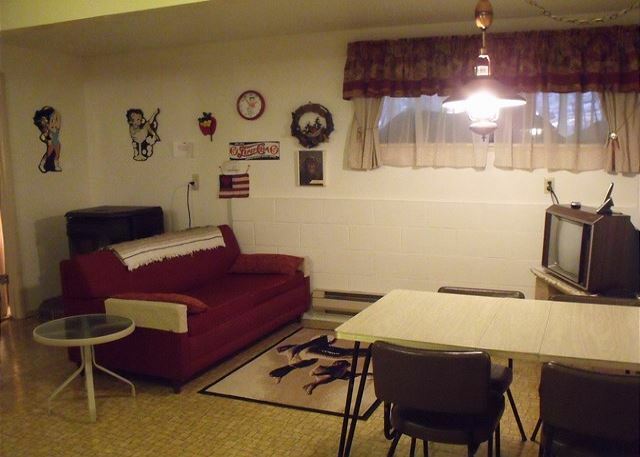 Two bedrooms and full bath downstairs - BBQ (summer only).This home does not offer rec center privileges. No smoking, no pets. Nice House in nice place. 1. you have clean up after you stay and take your trash to waste recycle facility. 2. there is no heater in master bedroom on main level. As an overload from our house nearby, we housed 6 family members at Mendonca during the Holidays . It was warm and cozy; plenty of room and had everything they needed - flat screen TVs upstairs and down, coffeemaker, etc. Intended to drive up Friday but snow storm kept us home. Drove up Saturday, got keys at 12:30 PM, got to cabin at 3:30 PM. Half of us traveled in 4x4 and were able to get to cabin in snow. Other half drove van that would not make it in as the roads had not had a chance to be plowed. Neighborhood power was out, cabin had electric heaters so no chance we were staying. Neighbor said worse snow storm in years and she did not expect power restored with before next day. Property Manager agreed to refund in full, need to follow up. Looked like a perfect sledding cabin, too bad it couldn't happen. This was most definitely a very big storm. Our staff called all guests prior to arrival alerting them of the storm conditions and giving them the option of coming or staying home. Many still came and some guests came and then left once they arrived to no power in their cabin. Many decided to stay with no power and enjoyed the mounds of snow that fell and the warmth of the wood burning stove in their cabins. Though our company is not responsible for road plowing or restoring of power, I do know that the power company trucks were everywhere working 24 hrs. to put power lines back up and removing down trees that had fallen upon them. With many inches of fresh powder snow that fell, this ended up being a amazing skii weekend for those who decided to weather the storm. The kids had a snow sledding weekend they will never forget!! "THE ADVENTURE OF THE MOUNTAINS". Better indoor lighting for reading and sewing would have been nice. A second snow shovel would have been helpful, plus kitty litter on hand for ice. Wood for fire was plentiful, but no kindling available. A small tool kit (screwdriver, etc.) on hand would have been helpful. Emergency candles and stove for power outages would have been helpful, but fortunately I brought my own! The stairs down to the wood pile become exceptionally icy and dangerous due to the drip from the roof overhang which is positioned right along the stair treads. Having a person on contract to shovel drive was GREAT. The cabin does host many, many windows. So many people visit up here to take in the outside. The cabin has light fixtures but with the wonderful view and accompanying sunshine the owners decided not to over light the cabin when the cabins location is so scenic. We liked the home and there is plenty of space for 2 families. The house was very clean and is easily accessible. I would certianly recomment the house as a great escape vacation rental. The only thing we missed was no bedsheets and towels were provided. We has a great time at this cabin. We had stayed at this cabin 4 years ago and we still like it. The only concern We had was that the lighter was empty to start a fire and we had forgotten matches. Another thing is that we kept running out of plates.